Photograph collection of webmaster 25256 at Wigan Springs Branch depot, date unknown. The nineteen year career of D7606/25256 included allocations to Eastern, Scottish & London Midland Region depots. Time between last Classified repair and withdrawal: 123 months - a record? June 1966 to Barrow Hill (41E). December 1966 to Haymarket (64B). June 1969 to Nottingham Division (D16) on loan, made permanent July 1969. November 1970 to Birmingham Division (D02). July 1972 to Nottingham Division (D16). February 1973 to Liverpool Divison (D08). Renumbered to March 30th 1974. 25256 was the 240th Class 25 to be withdrawn, one of three retired during April 1985. After withdrawal 25256 was stored at Crewe Gresty Lane by October 1985 and moved to Doncaster Works on January 24th 1986 as the 10.20am 9Z38 Crewe Gresty Lane – Doncaster Works with 25054, 25229/256. Surprisingly 25214 & 25256 then moved as the 9Z33 Doncaster Works – Gloucester - Swindon Works over March 20th/21nd 1986. Shortly afterwards Doncaster ceased cutting up locomotives leading to a number of locomotives moving to temporary storage at Goole Docks during August. 25256 was broken up at Swindon Works during October 1986. Noted Crewe Works November & December 1974 (Classified). D7606 was part of a batch of thirteen (7598 - 7610) Derby Works built locomotives destined for Tinsley (41A). The frames were laid down during January with delivery during the middle of March. D7606 was soon transferred to Barrow Hill (41E) during June. By the end of the year D7606 had moved on to Haymarket where it would remain for the next two and a half years. Photograph courtesy Peter Rigby. A lengthy train load of iron ore heads north under the A52 bridge and passes by Stapleford & Sandiacre signalbox in charge of D7606 & D7609 on November 5th 1966. On March 20th D7606 was noted on the morning freight from Millerhill to Penicuik with six wagon and a brake van. Within a week this line between Hawthornden & Penicuik would be completely closed. On March 5th 7606 worked a Willesden - Hither Green freight and also its balancing return working. On March 3rd 7606 & 7607 were noted assisting a Class 86 and its train between Birmingham New Street & Stafford (via Cannock). On May 25th the 14.15 Yarmouth - Derby from Norwich was worked by 25256 & 25142. On August 10th the Derby - Norwich - Yarmouth - Norwich - Walsall diagram was worked by 25256 & 25130. In the early hours of June 6th whilst waiting on the slow lines with a coal train at Nuneaton station 25286 witnessed the high speed derailment of the 5th's 23.30 Euston - Glasgow sleeper service. The two locomotives, 86006 & 86242 became parted, with the latter causing considerable damage to itself and the station, bringing down several gantries that caused minor damage to the Class 25. All the coaches were derailed, with damage being heaviest at the front of the train, tragically six lives were lost. By the evening of 6th the Bescot, Crewe & Saltley cranes were present alongside other engineering trains, in the hands of 24074, 25179, 25193, 25256 & 47034. Six coaches, (five sleepers and a BG) were broken up on site. By the 11th engineering/rewiring trains were still present including 24074 and 25193, the latter having been present since the day of the accident. Two days later only 24058 was on hand with an engineers train. 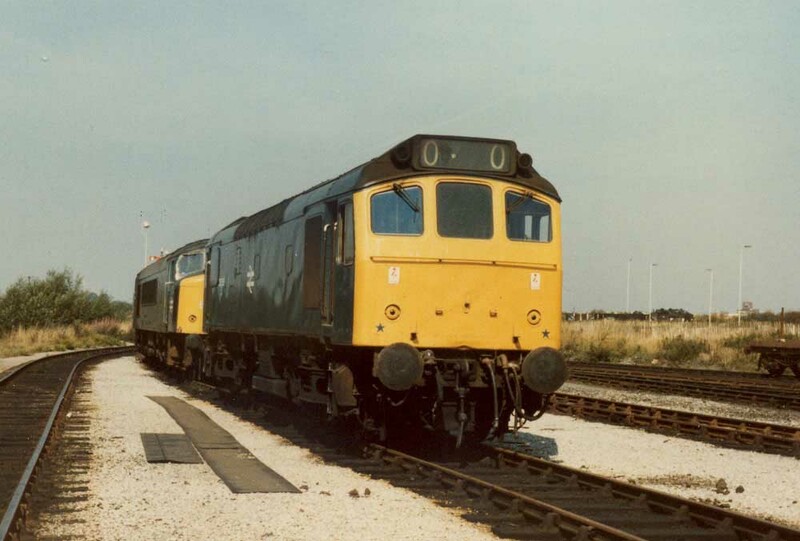 On June 15th a roundtrip Burton on Trent - Skegness day excursion was worked by 25256 & 25251. 25221 & 25256 were unusual power for July 1st’s 19.40 Dagenham Dock – Halewood freight. On September 8th 25251 & 25256 failed at Nuneaton with the Forders Siding - Garston brick train, 45048 worked the train through to Crewe, from here 47381 took over, whilst 25288 returned south early the next morning with the brick empties to Forders. The maintenance dispute brought many strangers into South Wales including a number of Class 25’s. So noted towards the end of March were 25294 on the 14.46 Great Bridge – Llandeilo flats (21st), 25177 on oil tanks to Llandarcy oil terminal (April 2nd) as well as a number of light engine movements west of Cardiff, 25256 & 25312 (10th) and 25184 & 25194 (12th). Photograph courtesy Gordon Hayers (from abpr posting) 25256 works its way around St Pancras station on a sunny clear morning, date unknown. 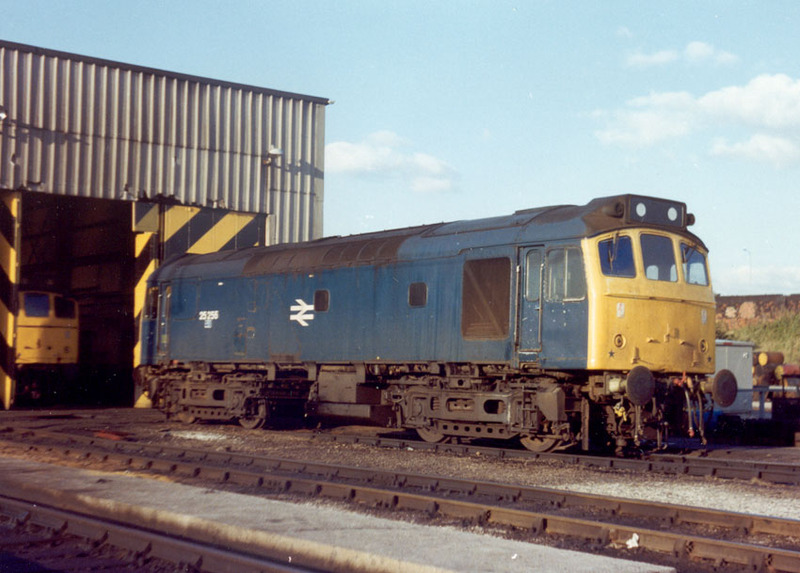 The locomotive was one of a number to receive a major repair at Crewe Works, the repaint mirrored that of the Class 47's, particularly in the placing of the number. 25256 received an 'E' exam at Tyseley during December. 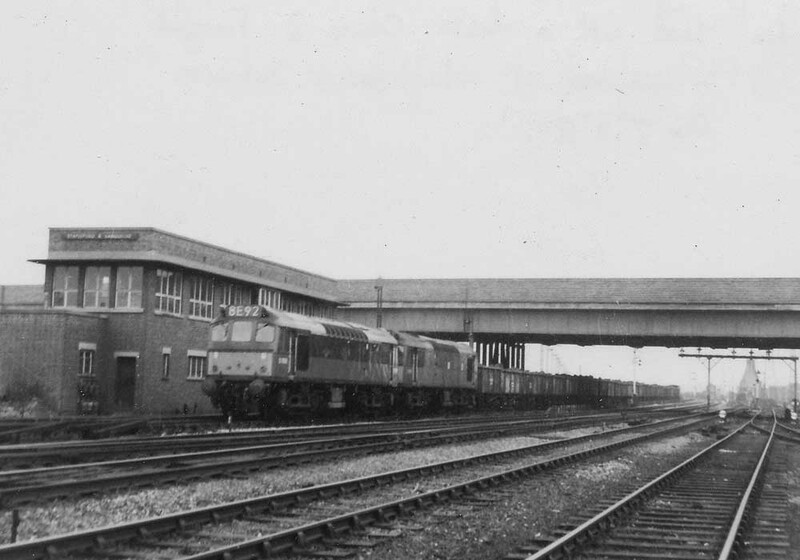 There was a multitude of Class 25s in the area of Bushey & Oxhey station from February 17th onwards following the dramatic derailment there of the 16th’s 20.25 Euston – Manchester due to a track defect. The locomotive 87007 was the only part of the train to remain on the tracks, four of the MkIII coaches ended up on their sides, with one (M12162) bringing down the overhead gantries, which blocked the slow lines. Most fortunately there were only minor injuries. Three breakdown cranes attended, from Bescot, Finsbury Park – brought in by 25279 & 25256, and Old Oak Common – arrived behind 25152 & 25189. The slow lines were reopened late on the 17th, the dc lines late on the 19th, the fast lines by the 25th. Spoil trains used 25222 & 25243 and 25130 & 25173, this first pair returned with track panels on 21st, followed by 25256 on the re-wiring train. On September 20th the 07.40 Euston - Aberystwyth from Wolverhampton and the 17.55 Aberystwyth - Wolverhampton were worked by 25256 & 25254. Photograph courtesy Jerry Glover. 25256 & 45052 catch the sun at Tyseley on September 6th 1981. The 08.40 Carlisle - Glasgow Central on September 10th was worked by 25256. On December 13th an early morning northbound service out Euston was assisted between Watford Junction & Bletchley by 25256. Late in February lifting of the Three Spires Jct – Gosford Green branch began, the demolition train on February 23rd was handled by 25256. 25256 & 25265 worked a Mountsorrel - Barnham stone train on July 20th. On August 29th the 01.00 Holyhead - Euston was assisted between Watford Junction & Willesden by 25256 & 25251, the power was off for engineering work. On June 5th a Euston - Blaenau Ffestiniog charter was worked roundtrip from Llandudno Junction by 25256 & 25285. 25206 & 25117 came to the rescue of 56031 on July 19th after the Class 56 suffered a turbo-charger failure working an ARC stone train at Verney Jct, the Class 25s taking the working to Wolverton and then the broken Class 56 to Bletchley for examination. The following ARC stone train stopped on the Bletchley flyover, the two Class 37s were removed, ran forward to Bletchley to pick up 56031, all returning to the WR on an empty working. 25256 arrived to take the loaded train forward to Wolverton, not surprisingly making hard work of the heavy load. The final transfer for 25256 took place during July to Crewe, bringing 25256 - 25258 together for one last time. On August 22nd 25256 was noted passing Cwmbran with bogie oil (?) tanks, the valencing to the center of No.2 cab was damaged. On September 3rd the 07.44 Shrewsbury - Aberystwyth and the 10.10 Aberystwyth - Euston to Wolverhampton were worked by 25256 & 25268. 25256 was noted eastbound at Slaithwaite on October 26th hauling coal wagons. A diesel multiple unit failure on February 18th saw 25256 work the 07.30 Skipton - Leeds. Another multiple unit failure on March 22nd saw 25256 work a Blackpool North - Manchester Victoria service throughout. On April 1st 25256 assisted two WCML services between Willesden & Camden due to the power being off for engineering work. On April 5th 25256 was noted passing Toton (damage to valencing on No.2 cab). The 14.50 Birmingham New Street - Leeds on April 11th was worked to Derby by 25256, here it was replaced by 45119. Photograph courtesy J Davenport. 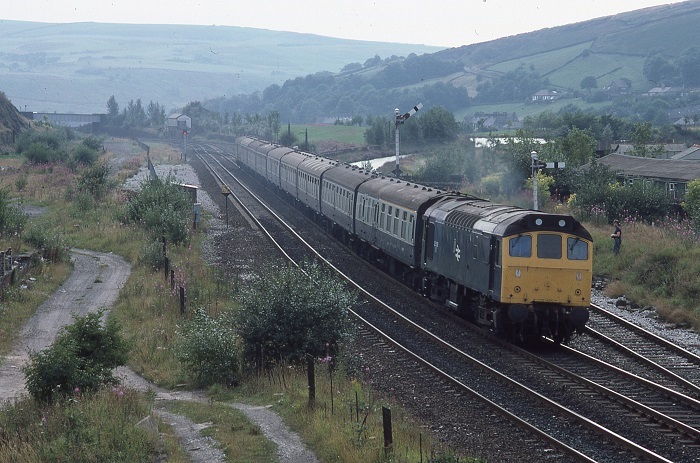 A hazy August 18th 1984 finds 25256 passing Uppermill (near Diggle), possibly with an empty coaching stock working. On October 6th the 16.35 Carlisle - Hull was worked as far as Skipton by 31428 & 25256. The next day 25256 assisted the 17.20 Glasgow Central - Bristol Temple Meads between Lockerbie & Carlisle due to the power being off for engineering work. 25258 & 25256 were noted on the lengthy Stanlow to Bishopbriggs bogie oil tanks on December 14th. 25256 was noted passing through Cwmbran on January 4th with a lengthy train of short wheelbase wagons. On February 4th 25256 was noted passing Bescot with a short freight. On February 23rd 25256 was noted at Derby with a short two-coach parcels working. The no.2 cab was showing damage to the valencing between the buffers. Photograph courtesy Ian Hammond. 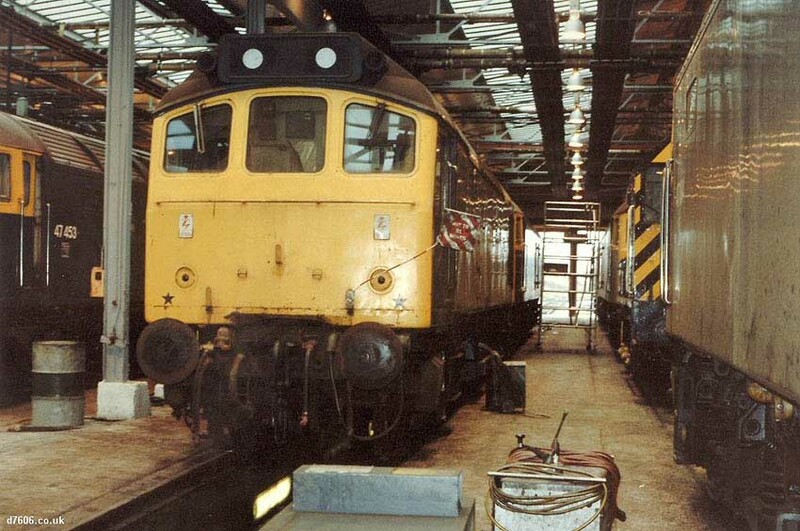 April Fools Day 1985 finds 25256 at Crewe Depot, having just been taken out of service. 25256 was withdrawn on April 1st 1985. 25256 had run for 123 months since its last Classified repair, which took place at Crewe Locomotive Works during November & December 1974. This length of time must qualify for some sort of record? 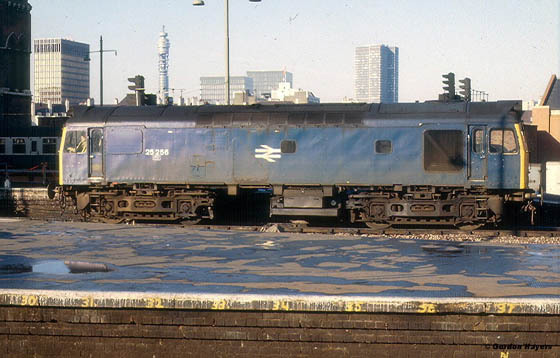 Condition Final: blue/yellow livery, blanking plates fitted, hand/footholds plated over, three-rung bogie mounted footsteps, straight sided sandboxes, damaged valencing at No.2 cab end (present from at least August 1983). Page added April 16th 2005.